Inspired by beautiful homes gracing the cover of ''COASTAL LIVING'' magazine, the excitement begins the second you enter this custom residence. Remodeled in 2016 with care and pride, applying the finest materials, from the ''African Sapele Mahogany'' front doors of your private entryway, to the imported marble flooring in all three baths and kitchen. The Master Bath has Carrara marble counter tops, and the guest baths have high end granite counter tops. The Gourmet Kitchen with ''WOLF/SUB ZERO'' appliances compliment the the custom cabinetry made to fit around the new appliances with no fillers. Premium ''Buckskin Oak'' hardwood floors take you from the private entryway, into the Den with floor to ceiling built in library/book shelves and an electric fireplace, adding that perfect touch. Lots 1,2,3 Blk 59 Town of Santa Rosa Vacant land. This land runs 450ft adjacent to a channel running to the bay this. You could not get pass the bridge with anything but a small boat but it appears that the lot might be able to have a dock on the water. The seller has had an environmental survey done on this property. There are .17 ac of wet land on this property but that leaves .26 acres of up land to built on without having to deal with the wetland for egress. The up land part of the property is on Wilson road. Attached Survey and report in the documents. This is a wonderful end unit Gulf front condo in the Crystal Beach area. 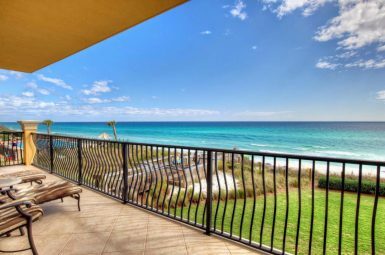 This condo has beautiful second floor views of the our white sandy beach and emerald green waters. There is a covered pool in the complex and Crystal Villas are within walking distance of restaurants, shopping and the new just completed and opened Henderson Inn complex. This condo sleeps 6 and the living area is unusually spacious. The balcony provides wonderful panoramic views of the sunsets to the west year around. This unit is owner managed and does more than $40k in gross rental income per year. You will not find a better Gulf front Value in the Crystal Beach area. The excitement of this custom residence begins immediately overlooking the #15 fairway, lake and bridge in the highly coveted, gated, and secured, golf community of Regatta Bay.The Brick paved driveway leads to an impressive entrance with 10' mahogany doors. Entering the opening of the grand foyer the large seamless glass windows offer sweeping views of the golf course. This 3 bed/3.5 Bath home has a desirable formal dining room which adjoins into the great room and open kitchen. Any cook will fall in love with the granite counter tops, custom cabinetry, Viking gas cook top, GE Monogram oven with Advantium High Speed infared cooker , warming drawer, Bosch dishwasher, ice machine, wine refrigerator and a huge walk-in pantry. A Stunning beach sanctuary, nestled in the heart of Watersound Beach, boasts the largest private pool in this highly coveted subdivision. Backing up to Deer Lake State Park and directly across the from the "Puttering Green". This 6 bedroom home, with fine finishes and upscale appliances is sure to capture the heart of every buyer seeking the best. This newly constructed ''Ledman built'' cottage home features two different living areas and 4 bedrooms & 4 baths. There are upscale finishes with granite, tile, SS appliances, and hardwoods floors throughout. This fully furnished home currently sleeps 11 but with some re-configuration could easily sleep 15. There are generous porches off both of the front living areas and also off the master bedroom.There is an abundance of out side porch space. The home's location is superb with the tennis courts, west pool, basketball court and new kids playground just steps away from your front door. One of the many walking paths in Carillon begin down your front steps.The third floor porch off the master bedroom has wonderful panoramic views of the Carillon community. This home is really brand new. Redfish Village is now a popular, thriving community thanks to the arrival of numerous new vendors and lots of positive real estate activity. Additions include cafes, dining and various other services with potential for more to come! Market values are steadily increasing and it's still a fantastic time to purchase or sell your Redfish Village condo! Welcome to RE/MAX Beaches. As part of the trusted RE/MAX network we offer a commitment to excellence and a level of expertise unmatched in the real estate industry. We understand that buying or selling your home is an important decision, and our goal is to always exceed your expectations. Whether you are buying or selling your property, we will be there throughout the whole transaction, and guarantee a smooth process every step of the way. We are located in the heart of scenic Highway 30A on Florida’s Gulf Coast. We specialize in real estate from Panama City Beach to Destin and everywhere in between. Our agents are also Certified Distressed Property Experts and can keep you up to date with all bank owned listings throughout the region. RE/MAX Beaches is your number one 30A real estate resource. We have access to all the latest listings on beachfront and near beach vacation homes, townhomes and condos, waterfront properties, golf course properties and vacant land properties in the Panama City Beach, Sandestin and 30A area. For those seeking a relaxed beach lifestyle or a second/investment home, there's no better place than Florida's Gulf Coast! We know that selling your home can be a stressful endeavor and at RE/MAX Beaches, we promise to help you through the process and secure the best price possible for your home. We pride ourselves on our knowledge of market trends in our community, our personalized customer service, and our attention to detail. Browse through our Gulf Coast and 30 A Real Estate today and let us know how we can help! Why pick South Walton Real Estate? Watch this Stunning Video courtesy of Moon Creek Studios and see for yourself why there’s no place better! Get all the hottest new listings delivered to your inbox! Sign up for our e-newsletter today!